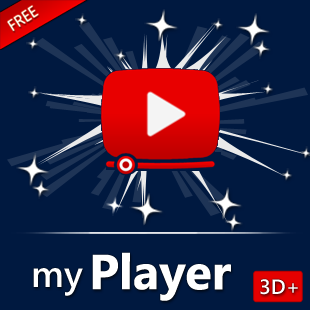 The myPlayer 3D+ application for Windows PC's, Laptops or Tablets is an innovative cloud-enabled media player and video editing app that extends the visual feeling in your Windows Device. A media player as it should be to every platform and device! The application comes in two editiions: A free one (myPlayer 3D+ Free) and a paid one (myPlayer 3D+). The difference of the two is that the free version displays some ads. myPlayer 3D+ is an innovative cloud-enabled Media Player and Video Editing app that extends the visual feeling  in your Windows PC. on your OneDrive account, from Youtube (using a special toolbar) or from Web links. Special Effects can be added during the playback, making your videos really exciting (e.g. 2D to 3D, Cartoon, etc.)! You can create playlists from your favorite’s media combining videos and music from your collections together. or upload local videos to your OneDrive. - Cartoon mode: Your video becomes a cartoon series! - adjust the contrast, the brightness and the saturation of the video! - Rotate/Flip the video (very useful for videos that are recorded/uploaded to Youtube with wrong format). 6 different cases are supported. The Video Editing feature allows you to Edit, Convert or Stylize a video. A preview window will guide you when choosing effects, brightness, etc. -  Convert a video from one media format to one of the following: MP4 (.mp4), WMV (.wmv) or AVI (.avi). The PlayTo option allows you to send the playable part of your media file (video or music) for playback to other devices. The other device must be DLNA compatible and on the same Network with your PC. When you sent a media file to other DLNA you are able to control the playback from both PC and device. You can also switch to other apps and do some other work while the playback continues. We are working to expand the list in app's future updates and include new media formats.